to dumping it, when and where this is permitted. 3. To satisfy the legal requirements of having a HT. 1. It had to take up as little space as possible while still being practical. 2. It had to be idiot proof. 3. There had to be a minimum risk of smells. closing the existing waste outlet tru-hull. Mold # 10B278 – 10 Gal – US$156) fits perfectly once you remove the shelf. (Contact Vic at Raritan 800 352 5630 – superb service). There is plenty space to store the usual bathroom stuff afterwards. as I have little interest in sailing around with raw sewage onboard. live in a place with a working pump-out station). entering the cockpit area. This may sound like overkill but it works well. 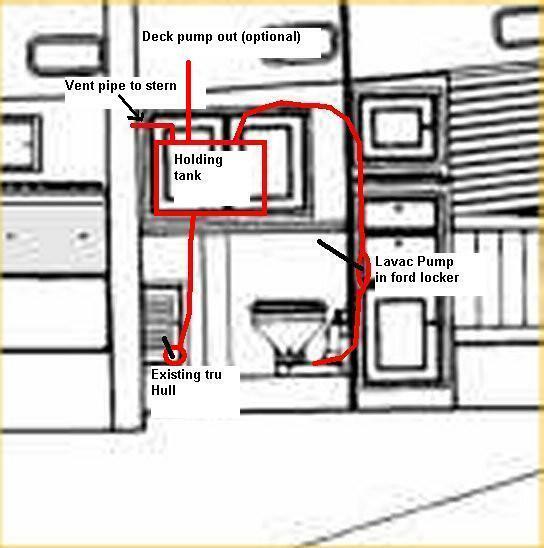 An inline filter could also be installed directly to deck level. THERE IS ONE WORD OF CAUTION WITH THIS SYSTEM – Nothing (INCLUDING TOILET PAPER) can be put in the head, unless you have eaten it first. Paper will solidify in the tank and block the exit (easy to clean but unpleasant). This has never been a problem on ERIU as all such items go into a little brown bag for subsequent disposal. 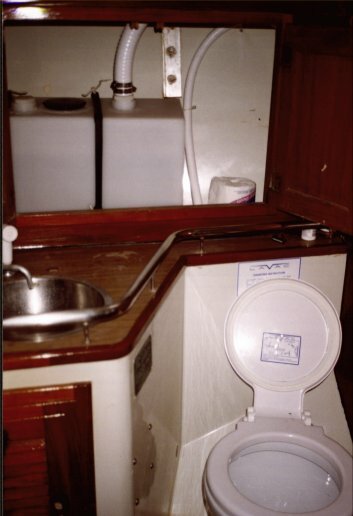 While I was at it I decide to replace the Raritan heads with a Lavac model as I firmly believe that only the British make good marine toilets (they have to be good at something). This system, however, should work with any heads. 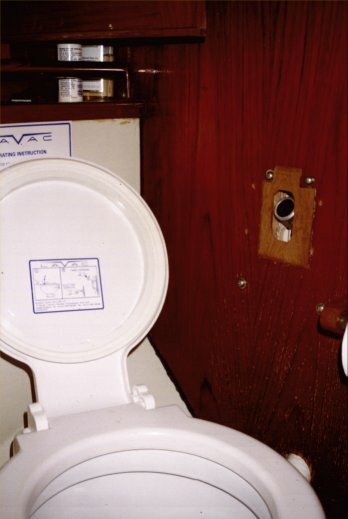 Note handle insert for lavac pump, on the right hand side. 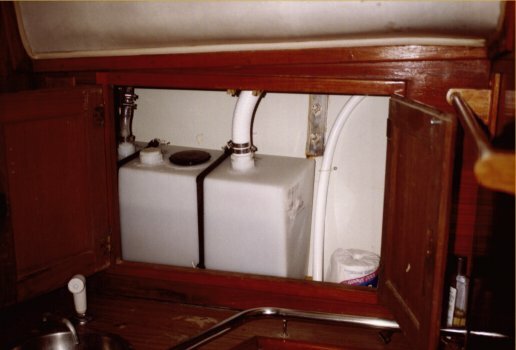 Connections from R to L, Waste Inlet – Inspection Plate – Deck pump-out (blanked off) – Vent to stern.